Rain in Anglesey, in November? This really is a race like no other. 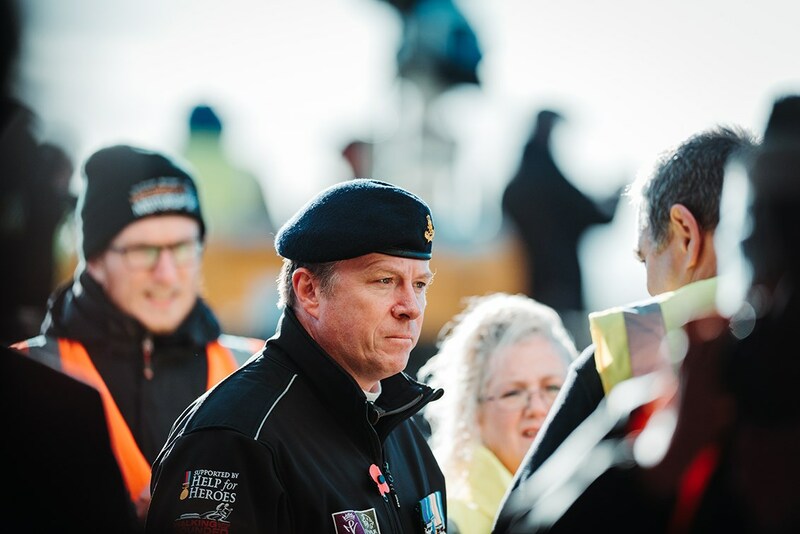 It’s 10.30am on Sunday at the 2018 Race of Remembrance at Anglesey. Out on the beautiful clifftop circuit more than 50 rain-soaked sports and saloon cars are tussling for position after seven and a half hours of racing but in 15 minutes time they’ll roll to a halt on the grid, the track will fall silent and everyone present at the event, teams, marshals, spectators, volunteers and staff alike, will congregate in the pitlane to pay their respects in the annual remembrance service held at the 11th hour of the 11th day of the 11th month. This being Wales, voices are raised strongly in song, too – hence that organ in the pitlane. 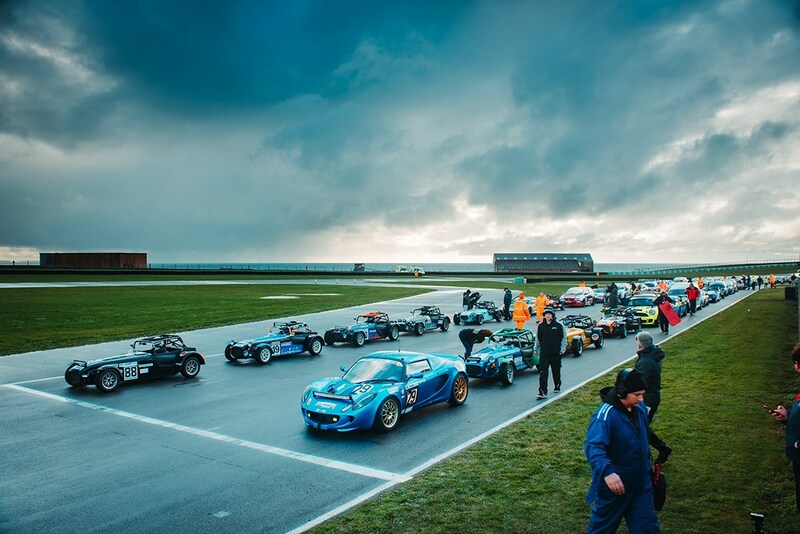 This year CAR was among the competitors, racing a works Caterham 310R in the 12hr endurance race against cars of all shapes and sizes; Lotus Elises, Mazda MX-5s, Porsches, Morgans, Minis and even a Honda CR-V – more on which later. 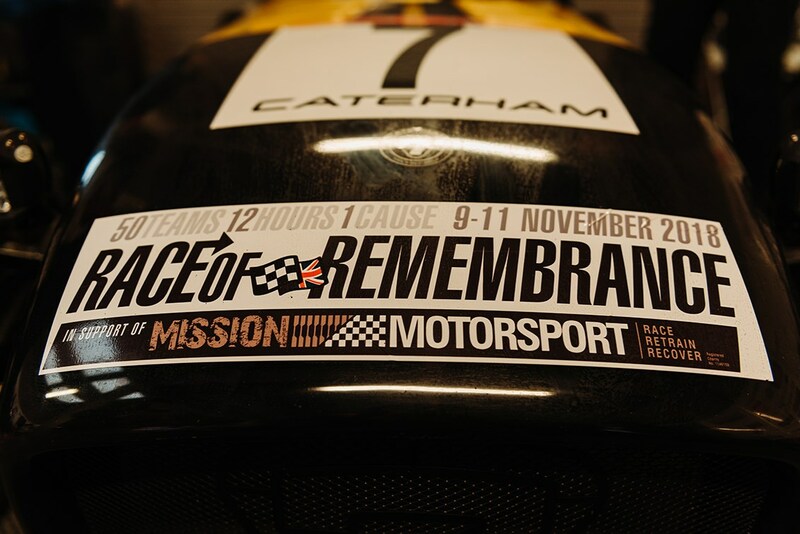 In its fifth year, the Race of Remembrance 12hr endurance (in two six-hour halves over two days) is the biggest single event of the year for its organisers Mission Motorsport, a charity run by forces veterans and serving officers as well as professional motorsport personnel. 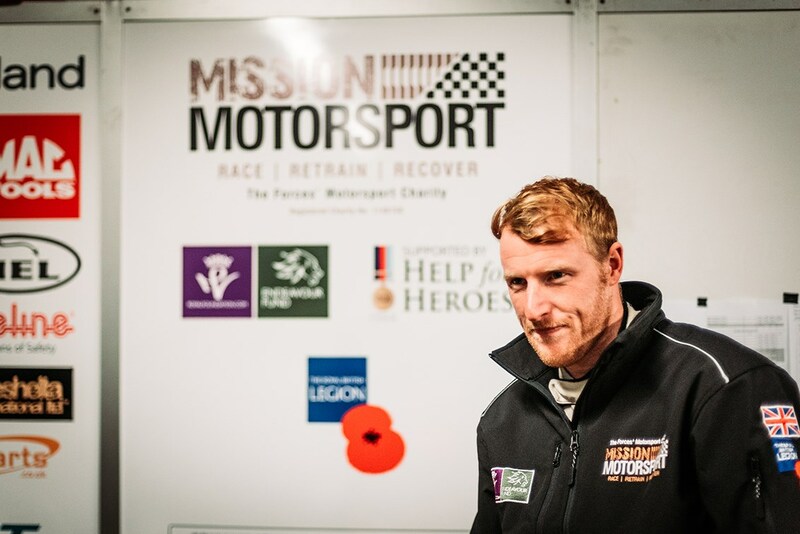 Under the mission statement ‘race, retrain, recover,’ it exists to help the recovery and rehabilitation of servicemen and women affected by military operations, some of whom have endured trauma we can scarcely contemplate. 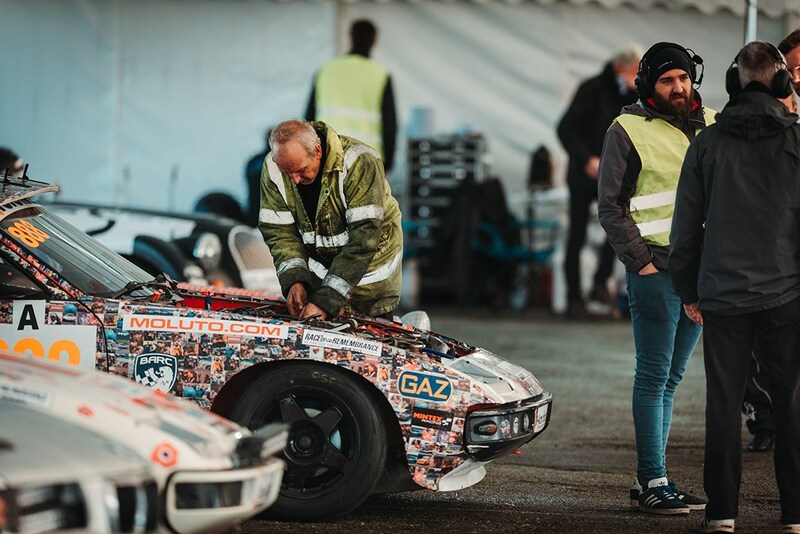 Among its many duties, MM coordinates training for qualifications to return to work to vocational support, referral for treatment and all sorts in between, much of it through the catalyst of getting its beneficiaries involved with motorsport. Coming together in our team with Caterham’s own very lovely, very lively Seven 310R are three drivers: myself, fellow journalist Neil Winn and Mission Motorsport’s own Danny Holland (above), formerly a Welsh Guardsman badly injured in Afghanistan in 2012, now a semi-pro footballer and accomplished driver of no little speed. 7.30am: We clap eyes on the Caterham 310R for the first time. Expertly looked after by Euan, Dave and Craig from Caterham, it’s finished in a liquid gold colour, its black nosecone flanked by a quartet of rectangular LED projectors in place of its usual round headlights and its totally appropriate no. 7 race number illuminated in blue. It looks fantastic. 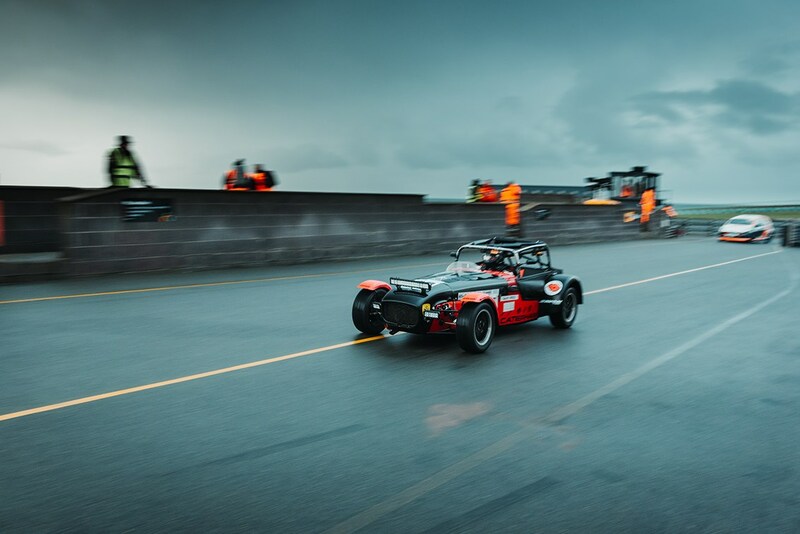 The 310R sits broadly in the middle of Caterham’s road and race car range, powered by the same 1596cc Ford-sourced Sigma engine that powers its entry-level Academy and next-rung-up 270 racers but with hotter cams, a revvier redline and a limited-slip diff, among other upgrades. 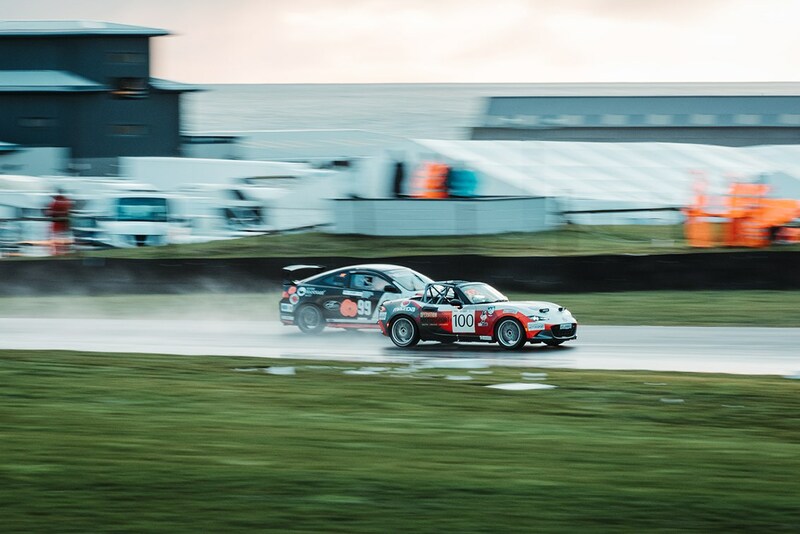 As in the Caterham 310R championship, rain or shine we’ll race on the same sticky Avon tyres with the type of chevron grooves that mark out Very Serious just-about-road-legal tyres and a compound like a Winegum in the sun. 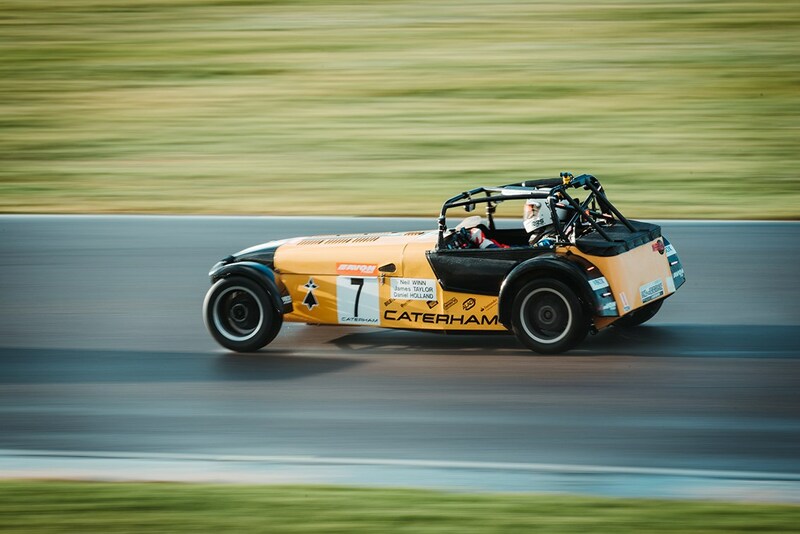 We’re racing in a class designated for Caterhams, with the various other classes made up of other production-based cars of all shapes and sizes. With more than 50 cars on the grid, it’s like a summit meeting for British club racing. All cars must have engines below two litres, unless in the special ‘invitation’ class, for cars that fit the spirit of the event, if not the letter of the regular classes. All race on treaded tyres; slicks aren’t allowed. 1.30pm: Qualifying is split into ‘day’ and ‘night’ sessions, with each driver required to complete a minimum number of laps in each. The daytime sessions will set the grid positions for the race. 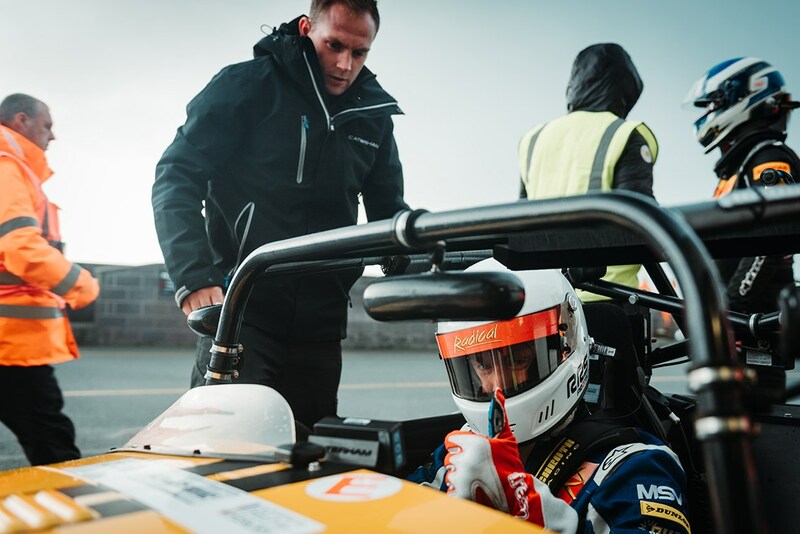 Neil has raced this car before in a couple of rounds of the hard-fought Caterham 310R championship, and proves he hasn’t forgotten how to drive it by immediately going fastest in his session. Good man! I’m in next, feeling my way around a wet but drying track. The Seven is spellbinding to drive. You sit with your legs straight ahead and your arms likewise, gripping a steering wheel the size of a large keyring but using your right foot to steer the car just as much as the wheel. This is the first time I’ve raced a Caterham but the 310R is so balanced, so intuitive to drive that after a few laps I feel like I’ve got a season under my belt. And the tyres are ace, finding far more grip in the wet than their semi-slick appearance suggests. Traffic is intense. The rapid Caterham has several extra chicanes to drive through every lap around and between cars from other classes, and when I finally get one clear lap I’m so excited I celebrate by outbraking myself for the tricky Rocket corner (uphill approach, blind entry, brilliant challenge) on what would have been my best lap, and wind up third fastest overall. 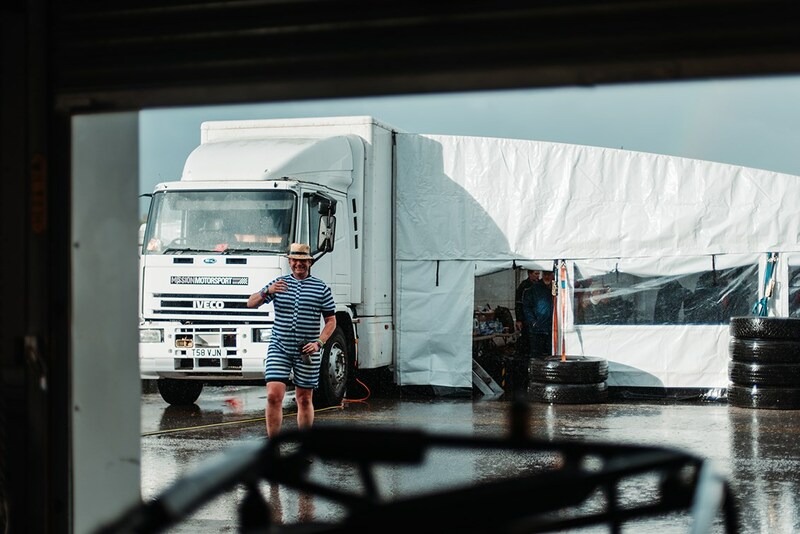 Danny jumps in just in time for the heavens to open, and comes back with a racesuit that looks like he’s been for a swim in the sea but laptimes that look like he’s been on a dry track. This bodes well. 5.30pm: Hmm. I’ve just left the pitlane for night qualifying and the circuit appears to have disappeared. 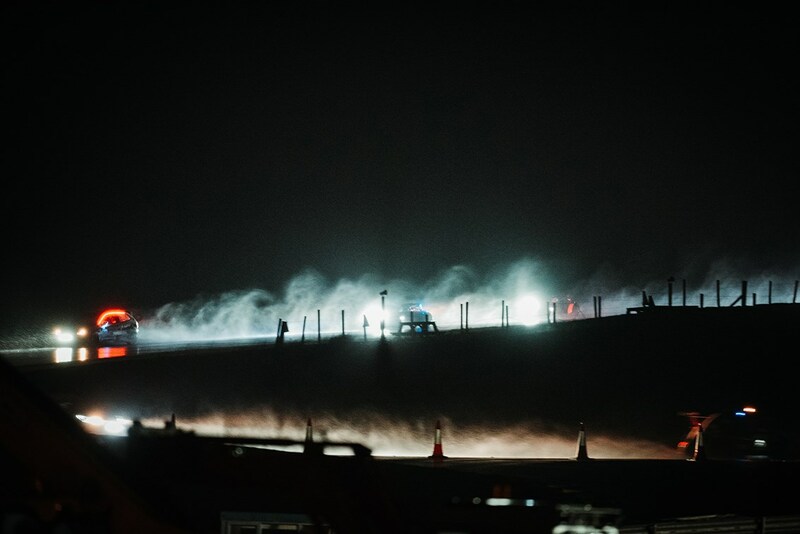 There are no floodlights at Anglesey, it’s pitch-dark and raining so hard the Irish Sea appears to be blowing directly onto the track at 90 degrees. Not ideal when you’re driving a car without a windscreen, nor a roof. Nor doors. A moment or two of acclimatisation and the reference points and mental markers are back; red reflective posts at the apex of each corner, cats’ eyes at the exit. The 310R is as faithful a friend as you could ask for in these conditions, its handling as trustworthy and consistent as you could hope. When it oversteers you never seem to run out of lock to catch it; when it understeers it always rediscovers front-end grip before you discover the end of the cats’ eyes. It’s even reasonably warm; my shoulders are soaking but with the driver’s seat between the transmission tunnel on one side and the exhaust on the other, it’s actually quite cosy in here; like racing a sleeping bag. 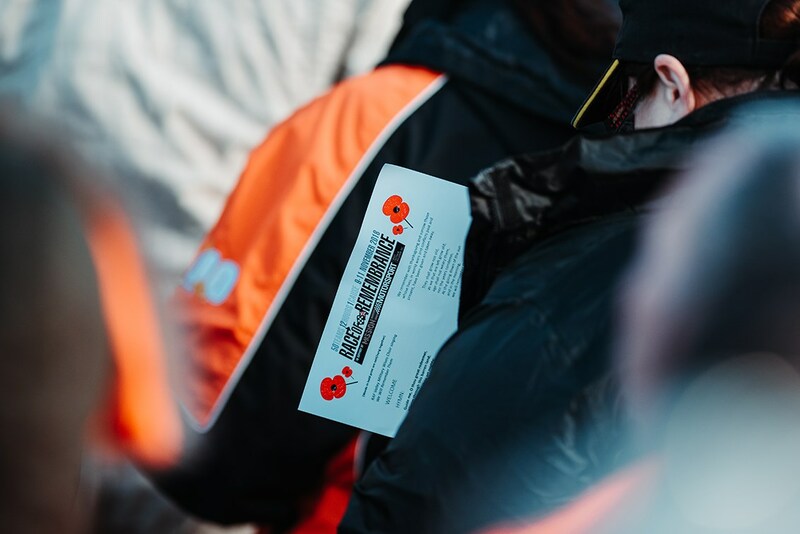 1pm: It says everything about the adversity-baiting spirit of the Race of Remembrance that it takes place at Anglesey in November. 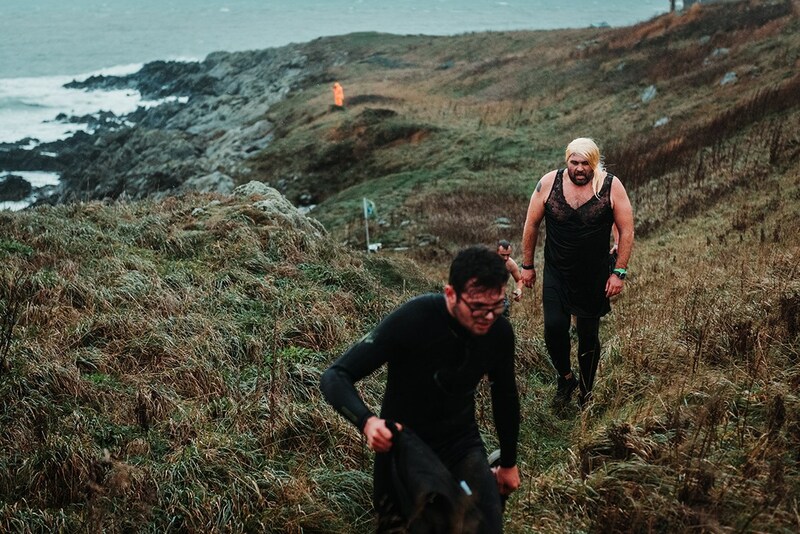 It says more that before the race begins, each team is asked to field at least one representative in the MMRoRBoF (the Mission Motorsport Race of Remembrance Biathlon of Foolishness) – a short run to the sea, followed by a swim to a buoy some distance offshore and back – or alternatively duck out and pay a nominal donation to the charity. 3pm: We have a lot on our mind, anyway. We’ve qualified fifth overall (so fast are the Caterhams that they make up eight of the first nine spots on the grid, Rob Boston’s rapidly driven Lotus Elise the only interloper) and Danny takes the rolling start. The first two corners are so nearly disaster, as he’s pushed onto the grass by one car at the first corner, before being tapped into a spin by another at the second. Undeterred, he hooks first gear, donuts the undamaged car back into the race and gets his head down. By the time of our first pitstop he’s climbed to second overall. It’s a brilliant opening stint, and there’s all to play for. 4.20pm: Driver change time. 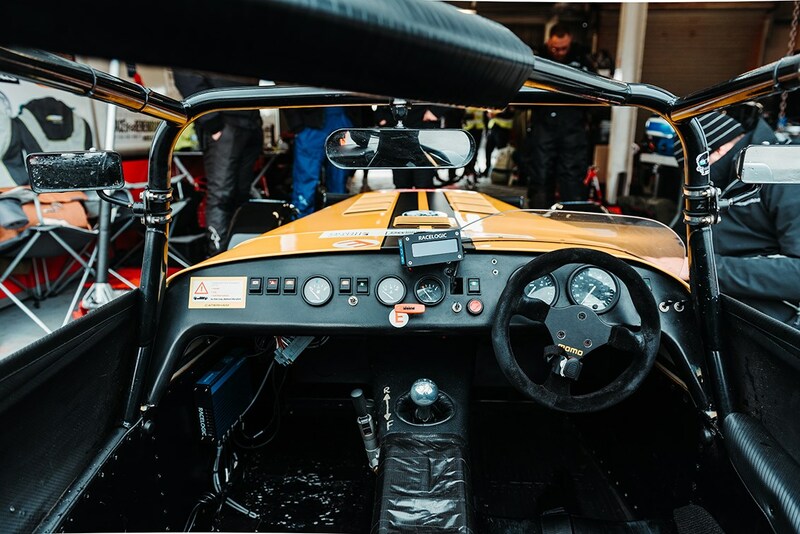 Post yourself through the top of the rollcage and your feet under the dashboard, exit the pitlane with a whiff of oversteer, zig-zag through the traffic out of the first corner and try and get into a rhythm. We must be going okay, because we’re doing plenty of overtaking but nothing is overtaking us. The next-level-up Caterham 420R packs a sequential racing gearbox, but the 310R uses the same snickety-flick H-pattern gearbox as its road-going equivalent. Craig and Dave have adjusted the pedals to make heel and toeing as easy as possible, and it’s a joy to use. Brake as late as you dare for the hairpin, flicking the lever from fourth to third to second almost as fast as you can say them, ducking into the slipstream of a rival Seven on the exit and feeling the revs rise on the run to the final corner… and then straight into the pits. We’ve got a minor wiring issue with our tail-lights, and have been given a Black and Orange ‘mechanical fault’ flag to get them sorted. I jump out and the team calmly and rapidly find and fix the problem, but by the time Neil can get out on track we’ve lost around three laps to the leaders. Who wants a race to be boring? 5.30pm: If we’ve been unlucky to lose time, that’s nothing compared to one of the team we’re sharing our garage with. Operation Motorsport is an initiative very much in the same vein as Mission Motorsport for Canadian and American service members and they’ve travelled across the world to be at Anglesey with a brand-new Mazda MX-5 Global Cup Car – a car so brand-new it hasn’t turned a wheel before this weekend, and has endured an endless stream of mechanical issues since the start of the race. The car looks fantastic, but it’s so box-fresh it hasn’t had time for any testing or set-up work beforehand, and it’s in the pits with a bust propshaft. 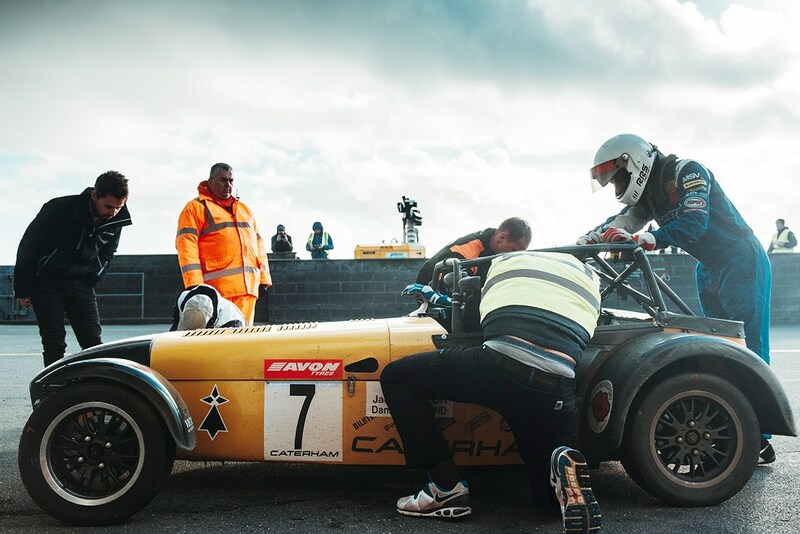 The Caterham guys roll up their sleeves and muck in with Operation Motorsport and Mission Motorsport’s crews to help get the car back in action. It really is a friendly atmosphere in here. 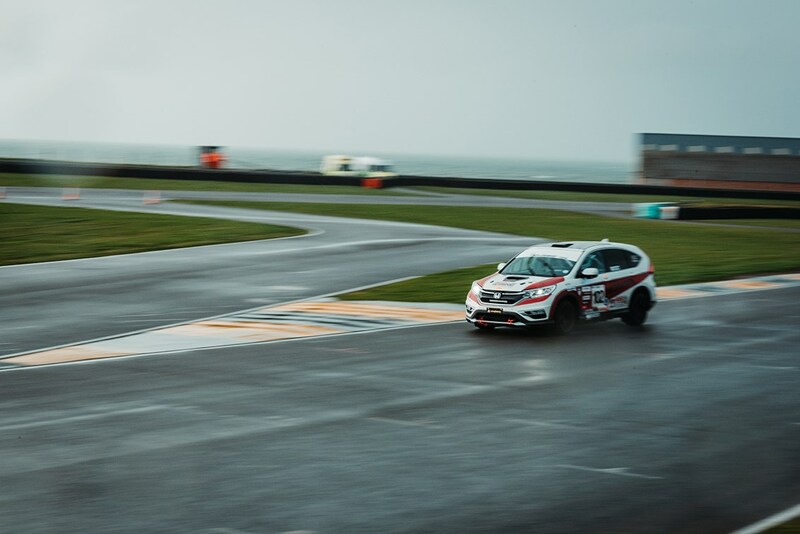 As well as our Seven and the MX-5, there are two cars being run by Mission Motorsport themselves – a Citroen C1 and a Honda CR-V. The latter, donated by Honda and converted for racing by the MM team, is a diesel auto – seemingly the worst possible basis for a racing car on paper but not in practice. Believe it or not, for a while it was the fastest car on track during night qualifying in the wet. It’s an auto because some of MM’s beneficiaries carry life-changing injuries. 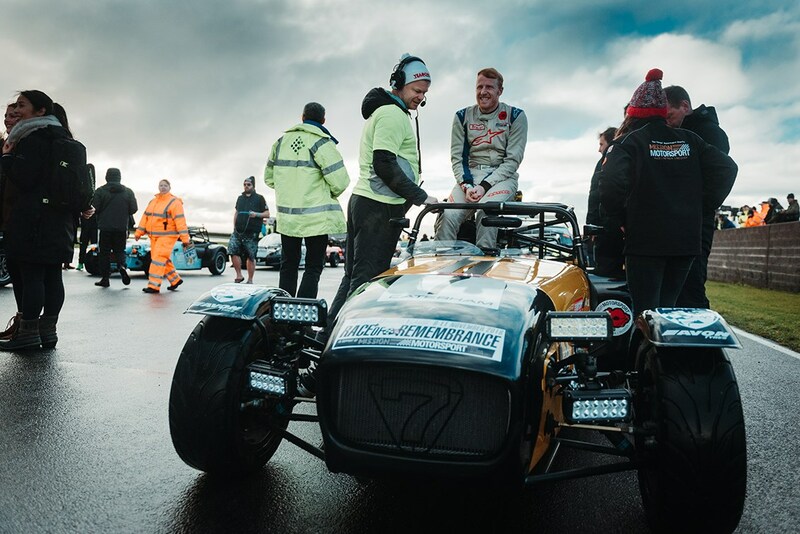 Some are amputees, many were novices to circuit driving when they joined MM but have gone on to become seriously accomplished racing drivers. 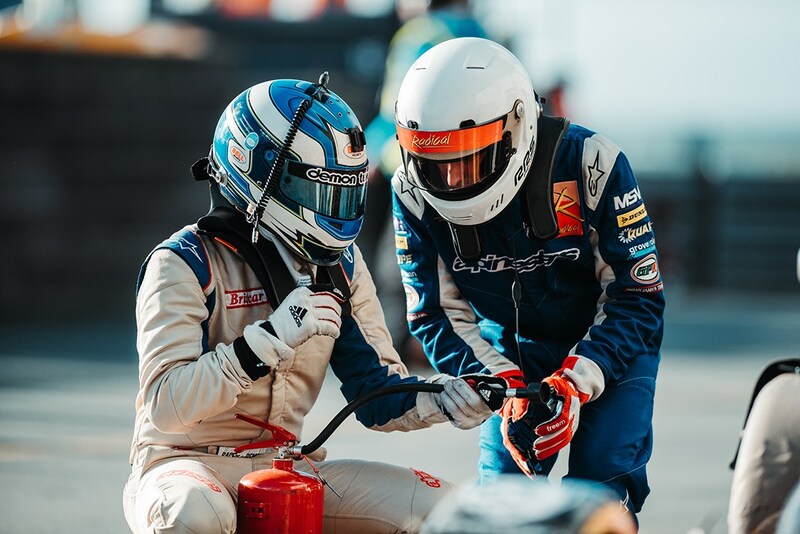 One of Operation Motorsport’s MX-5 drivers, US Marine Liam Dwyer, lost his left leg above the knee but is so proficient a driver he’s secured factory racing support from Mazda in the US. 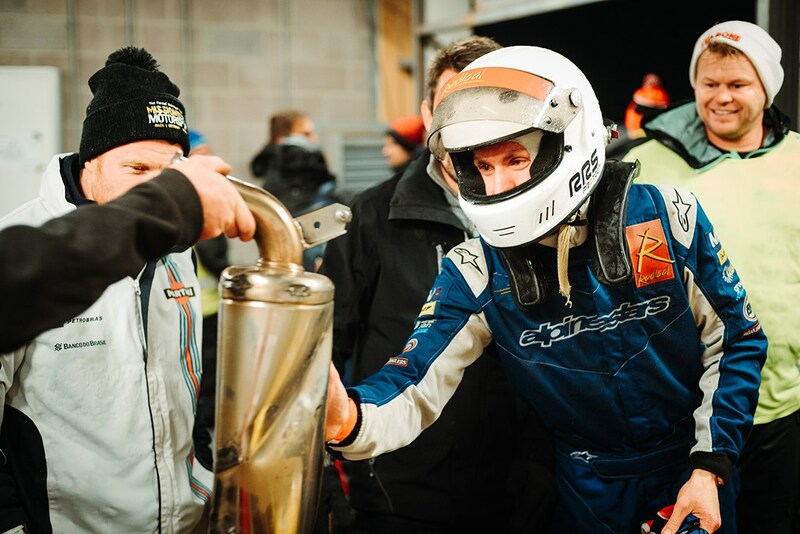 His team-mate for the weekend, British driver Paul Vice, sustained huge injuries in service and has risen from racing novice all the way to the British GT championship, partly through opportunities made possible by MM. 6.30pm: Out on track the rain has started falling with a vengeance and Neil’s played a blinder, climbing to lead the race overall. Danny jumps in but within a lap he’s back in, with a headlight issue. The team again fixes the problem in double-quick, remarkably stress-free time but we’ve lost another lap and have fallen outside the top 10. 8pm: I take over for the final hour, and the conditions have become horrendous. Bad weather in Anglesey in November, who’d have thought it? 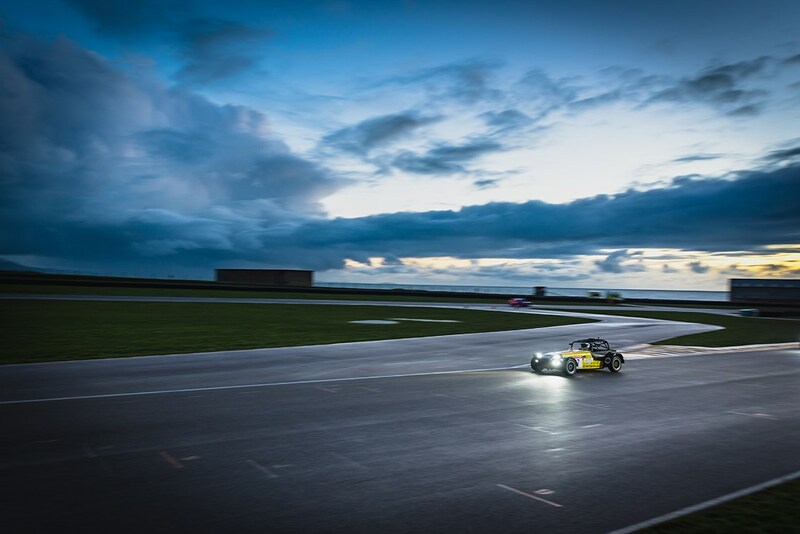 The challenge of the elements is all part of the spirit of the race, but on the first lap out of the pits I wonder if I’ve driven straight into the sea in the darkness. 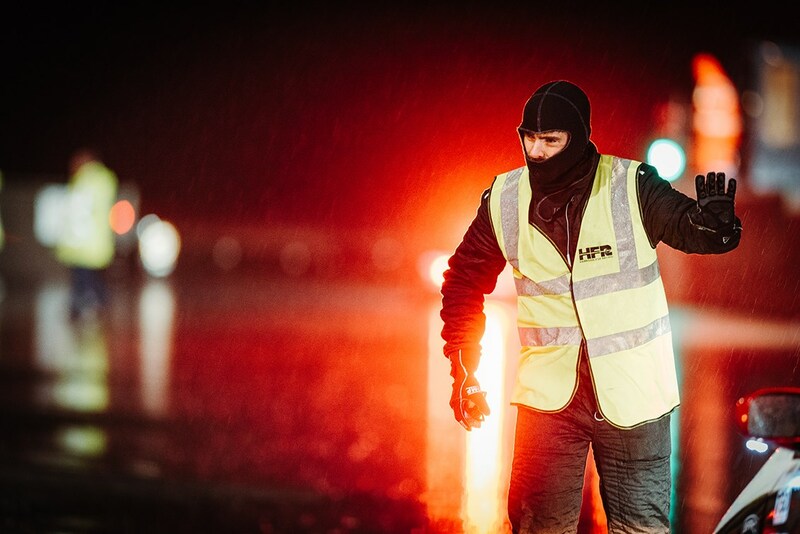 It is so wet out here, and the wind has picked up too, blowing straight through the rollcage and delivering body blows to both me and the car. But the 310R is perfect in the wet, its handling balance and tyres finding grip where there simply shouldn’t be. We’re a matter of minutes from the end of the first half of the race, and a safety car is called to recover a stricken car from the side of the track. The field bunches up, and now the spray is so extreme it’s becoming difficult to see much at all. With only three minutes left on the clock the lights go green, and we’re racing once more, one giant tailback of cars entering the first corner at different speeds. And the worst happens. My visor a kaleidoscope of refracted rain-lights in the spray, the front tyres aquaplane on an off-line patch of water, and in terrible, unstoppable slow motion my right front wheel touches another Caterham just ahead of its left-rear, locking our two cars together and sending us into a lazy, uncatchable spin into the infield. 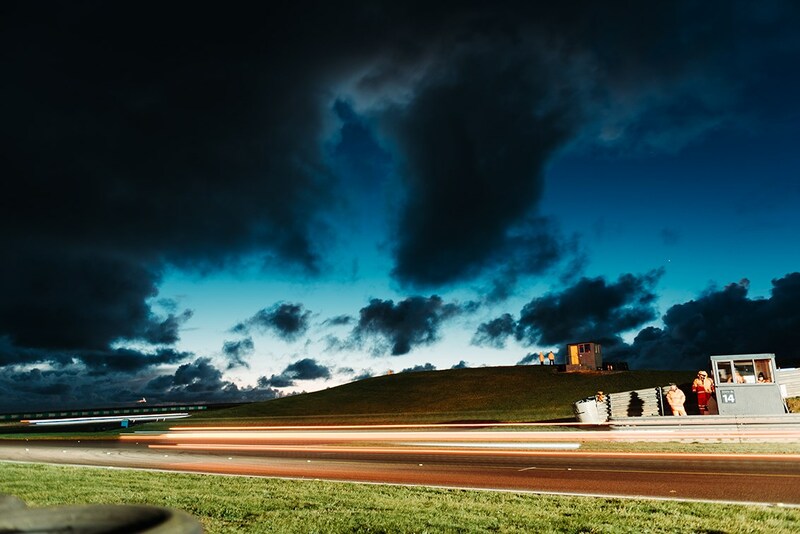 I slither to a halt backwards on the grass divider between the pit exit and the circuit, the car covered in mud. I can see the other car just ahead, it too stationary. I feel about two inches tall. My first instinct is that I might have not only ended our race, but potentially another team’s too, in a race where getting to the end and helping each other out is what it’s all about. It’s a horrible feeling. But wait… the engine’s still running, first gear goes in without fuss and the car steers straight. The exhaust is a lot noisier than it was (as it later turns out, because the silencer’s been pulled off), but otherwise everything feels surprisingly shipshape. I radio the team: ‘Guys, I’m so sorry, I’ve hit another car. The exhaust is damaged. I’ll pit.’ ‘Stay out, stay out,’ is the reply. It’s the right call; three minutes later the first half of the race is over. When I get the car back to the garage, after the most self-loathing in-lap I’ve ever driven (if there was enough space in the footwell, I’d be kicking myself), the team look surprisingly disinclined to kill me. And the merciless level of mickey-taking they’re dishing out suggests they’re not too annoyed. It turns out that because of the timing of the safety car, we haven’t actually lost any time or positions, and the damage is easily fixable – a new exhaust, a touch of straightening out for headlights and tracking alike, and job’s a good ’un. They take a hit well, do Caterhams. 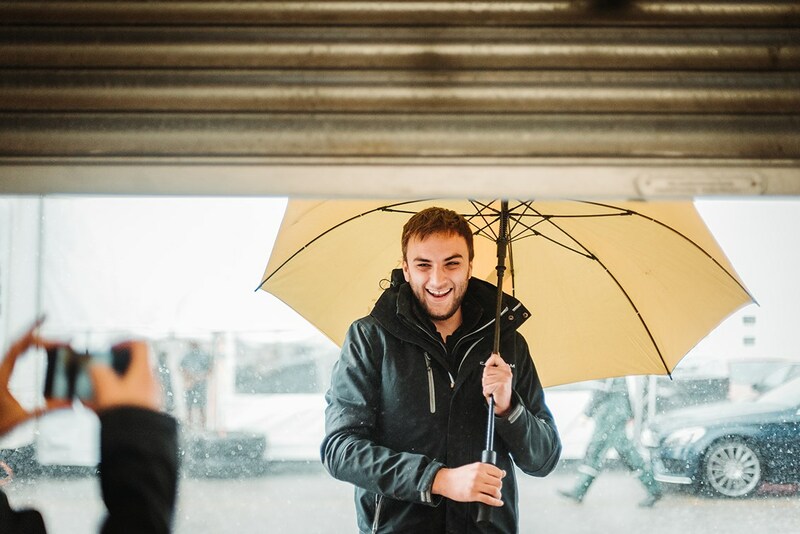 I want to find the other driver to apologise, but he’s already come to the garage – he wants to check I’m okay, says he doesn’t blame me given the extremity of the conditions and grouping of cars, and wants to know if I got it on video. What a gent. His team also lend us their tracking guides so we can check our steering for damage. We’ll start tomorrow P6, within striking distance of the Caterhams in front. Okay, that was a poor choice of phrase. 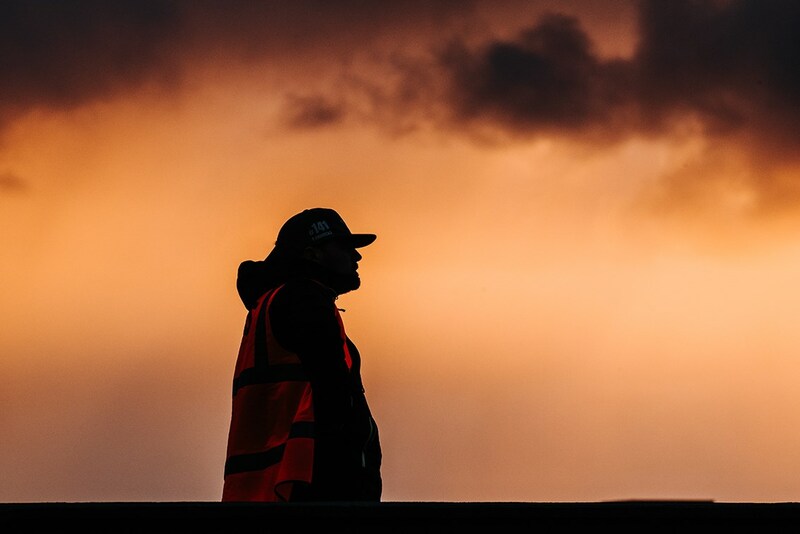 9am: I’m back in the Seven’s driving seat for the restart on Sunday morning, and it’s paradise – not only is it daylight, it’s not raining that much. I slice through the traffic as best I can to make up time on the cars in front, climbing to P4 before our first pitstop of the day ahead of the memorial service. 10.45am: The sun hasn’t made any appearance worth the mention at Anglesey over the last two days. And yet, as the cars roll to a halt on the grid just before the Military Wives choir open the service, bright sunshine fills the pitlane. ‘It’s becoming increasingly rare to find yourself standing alone with just your thoughts,’ James Cameron had said earlier in the weekend, and the service is as powerfully resonant as you might expect, with a further element of poignancy given that this year marked the centenary of the armistice that marked the end of the First World War. 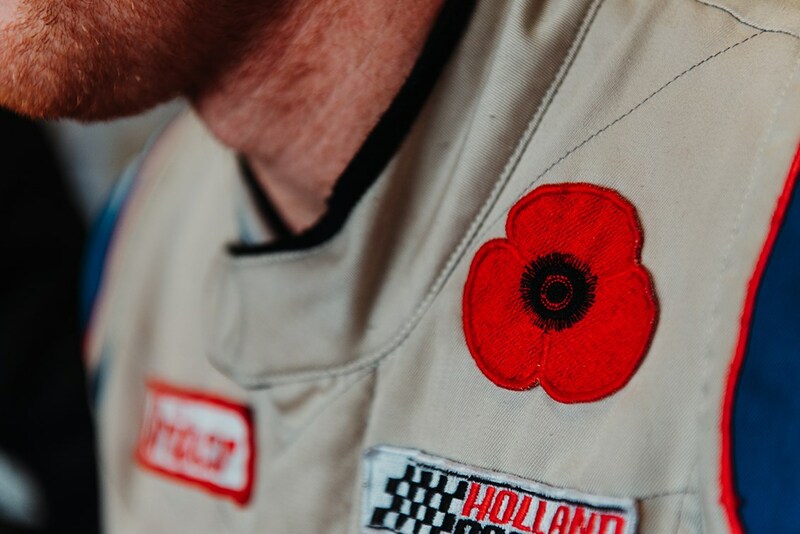 This is the reason this event exists; it is a memorial service first, and a motor race second. Nonetheless, to witness the restorative power of motorsport, its power to unite people, and the way it can give people the strength to support others and to support themselves is very powerful. James Cameron adds that MM has a duty to help its members in terms of mental health, and post-traumatic growth. ‘Most of our work happens nowhere near motorsport, but the racing stuff is visible. It drags people off the sofa and gets them engaged,’ adds Cameron. 3.45pm: We’re certainly engaged right now. We’ve been more or less the fastest car on track all day, clawing back laps over the competitors ahead, but we’re simply running out of laps to do it in. Danny is in the car for the final stint to the flag, and he’s on fire. He’s just set the fastest lap of the entire race, not once but three times, in a car that’s been racing for nearly 12 hours, on worn tyres and a wet setup on a dry(ish) track. Did I mention Danny hadn’t driven a Caterham before this weekend? He catches the leading car and passes it on the road to unlap us but the clock runs out before he can do it again and we finish the race fourth overall, and second in class. Not a bad effort, eh? If we’re disappointed at missing out on the overall podium it doesn’t last long. We’re proud of the job we’ve done and of each other, full of memories from the weekend and looking forward to the future. 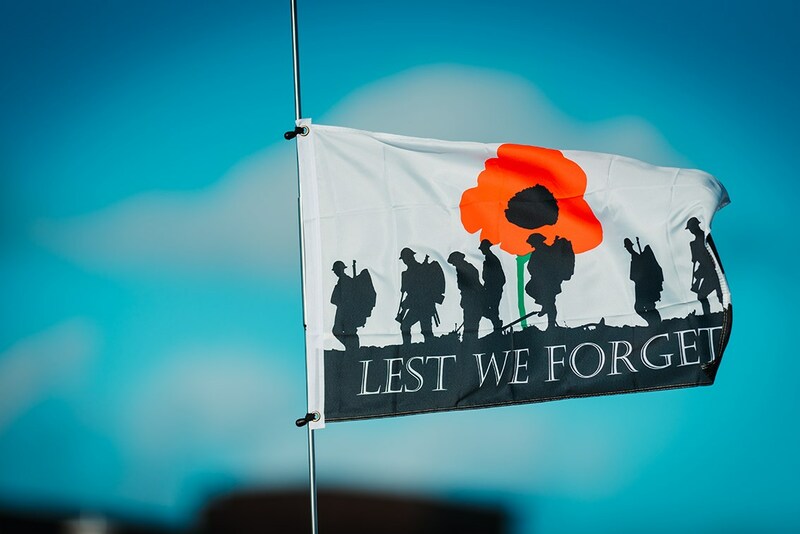 Which, I think, sums up everything the Race of Remembrance is about. The race might not be an end in itself, but it’s one unlike any other.